It happens that cryptocurrencies and their back-end technology, the Blockchain, is becoming mainstream in today’s exchange market plazas. The new main character in the new game is Bitcoin, which is taking the upper hand but it is not alone so far in its adventure as more than 300 new crypto-coins have seen the light in the last year. Some figures show how the crypto market has gone up in one year to reach a market cap of $500 Billion worldwide. Investors from all over the world, including large companies, banks and governments have seen the potential cryptocurrencies have and are starting to be aware of their possible disruptive outcome. It is the world of cryptocurrencies and the technology behind them, the blockchain, a complex one though, it needs to get out of the obscurity and show the traits and goodness it can deliver as a new disruptive technology, meant to distribute the richness and towards a full democratization of the monetary system. It is not about the past, but the bright future ahead. 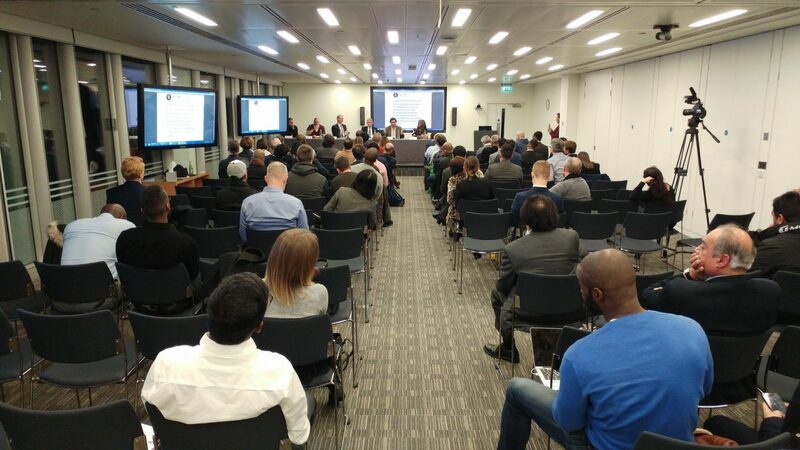 Precisely, this was the main idea submitted in the conference “The Future of cryptocurrencies and blockchain technology” that took place last December, 20 at the DLA Piper headquarters in the heart of the City of London. Presented by blockchain expert Dinis Guarda and introducing a top panel of Special Guests including crypto and blockchain experts from all around the world the likes of DLA Piper head and host Martin Bartlam, trader and ex-banker Jonny Fry, crypto developer Derin Cag, blockchain expert Genevieve Leveille and crypto-trader Athanassios Kollyris. There is still a long way ahead as cryptocurrencies are meant to be distributed and open for everyone. Mr Guarda continued his speech highlighting the power of the blockchain, the back-end technology in which most cryptocurrencies are based of. It was the blockchain one the most interesting parts of the conference. The public, around 100 strong, was amused of how this breakthrough technology works. It was Genevieve Leveill territory though. The AgriLedger founder knows a thing or two about blockchain. With a whole professional career related to blockchain and disruptive technologies, Ms Leveill started her speech about how the blockchain works and the inherent traits it has. Basically, the blockchain means democratization of access and of who intervenes in the process. It is democratic because it is changing the status quo in the world. The old capitalist blocks, USA and Europe are stepping aside, running late into a revolution already started elsewhere in the world. According to Ms Leveill, China, Africa and Russia are among the areas of the world where blockchain and thus cryptocurrencies are being more developed. It is also transparent and safe because every time a block is build inside the chain supply, everyone that looks up in the blockchain sees what is happening there, and records of the transactions are written in them. Removing intermediaries and middlemen would mean cheapest world transactions with a better security. Without the need of a fully regulated logistic, countries and some areas of the world with lack of infrastructure can have access to complex and worldwide based transactions schemes. And she continued that the distributed ledger technology is as big and as important as it was the “dot com” back in the days, “a whole new revolution of how humans will communicate in the near future”. The blockchain was a main part of the whole conference, but it gave away its main role as cryptocurrencies started to soar. It is, indeed a main part of the blockchain to build economic-driven assets, the likes of cryptocurrencies, and indeed it will change the rules of the game in the near future. …it is the fourth digital revolution of the humanity.